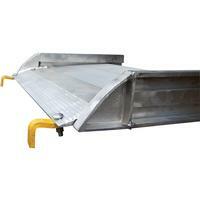 Enables delivery men, shippers, and receivers to load and unload trucks when docks are unavailable. 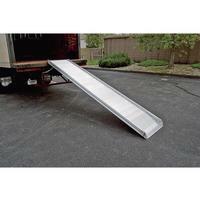 Ramps feature a 11⁄2" high safety curb on each side. 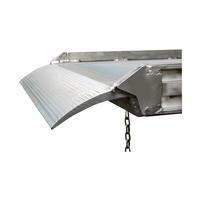 Heavy duty steel chains with steel grab hooks are attached to each side of ramp for safely securing ramp to truck. Constructed of strong aluminum alloy with non-skid tread surface. 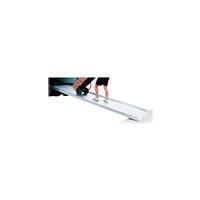 The ramp is lightweight and easy to handle. Available in either an overlapping style that rests on the truck bed, Type "A" (Pic. 2), or steel hook style that mounts onto the truck extensions, Type "B" (Pic. 3).